PALM SPRINGS — Used car giant Off Lease Only can continue using an overflow lot for vehicle storage, the Village of Palm Springs’ Land Development Board decided on Tuesday. With nowhere else to go, the huge used car dealer would have faced a storage crisis had the request been denied. Dozens of employees attending the meeting burst into applause. Off Lease Only needed to extend its usage of the lot because plans for a sprawling new dealership at 1200 S. Congress Avenue are moving forward slower than expected. The appeal was approved with a 3-2 vote. 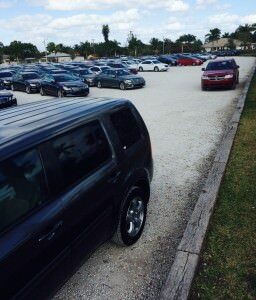 The overflow lot is located at 3475 Second Ave. North, directly behind the Lake Worth dealership at 3531 Lake Worth Road. Off Lease Only filed an appeal to continue using the storage lot after the Board’s director last September denied Off Lease Only’s initial request. In 2012, Village officials granted Off Lease Only a 2-year temporary land use permit, which expired in November 2014. Off Lease Only has used the lot since 2010 to store hundreds of cars. Discussion on Tuesday focused on a 2014 state law, known as the “Legislative Extension,” that allows for an automatic extension in cases of development or permitting under certain circumstances. Miskal claimed the improvements Off Lease Only made to the lot qualified as development. Some Board members disagreed. Miskal said improvements such as clearing land, spreading shell rock, installing a chain link fence, removing sheds and installing an irrigation system could be classified as “development.” All required municipal permits. Board member Charles Nefzger voted “yes” on the appeal but said the state law Miskal cited was confusing. Off Lease Only Palm Beach. “Whoever wrote this law is an imbecile,” Nefzger groused. He said he voted “yes” because he wanted Off Lease Only to have adequate time to complete construction of their new dealership on South Congress Avenue. 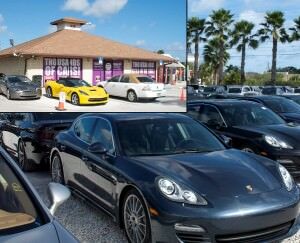 The used car dealership sells about 1,000 cars a month in Lake Worth, employs more than 400 people and generates more than $500 million in annual sales. With stores also in Miami and Orlando, Off Lease Only pumps an estimated $30 million in tax revenue into the local economy. Find out what customers think about Off Lease Only by visiting our new review site: OffLeaseOnly Reviews and Customer Testimonials. Read the incredible OffLeaseOnly Reviews for each store: Miami, Palm Beach and Orlando. ← Previous Story Off Lease Only Astounds By Selling 2,633 Used Cars in January 2015! !